Tree marks the vicinity where gold was discovered by Paddy Hannan, Thomas Flanagan and Daniel Shea in 1893. The first tree was planted on the spot in 1897. 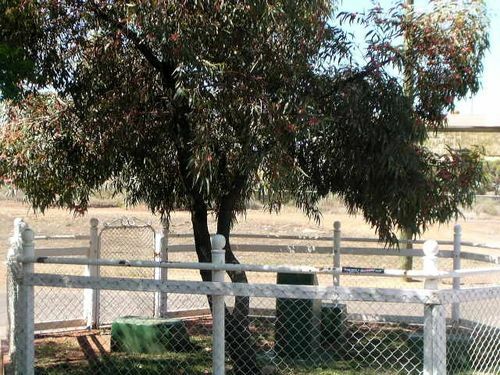 The tree died in 1935 and was subsequently removed and replaced with a kurrajong tree planted by Paddy Hannan's granddaughter. To mark the 100th anniversary of the find a new tree was planted on 13 June 1993. A plaque was unveiled at the site in 1929 during the centenary of Western Australia in honour of Paddy Hannan. When the goldfields observances of the Centenary of West Australia take place in the near future tablets will be erected at suitable spots to mark historical events. Two of these will be associated with the name of the late Lord (Sir John) Forrest and the late C. Y. O'Connor and the third with the name of Paddy Hannan. The W.A. Centenary Committee, in Perth had suggested that the two former should be placed at the Mt. Charlotte Reservoir to mark the completion of the water scheme and that the third should be fixed near Paddy Hannan's tree. The local Mechanics' Institute committee came forward with a suggestion to tlhe Kalgoorlie Municipal Council that these tablets should adorn the entrance of the institute buildings instead of being lost to the view of the public and trans-Australian travellers if the plates were put elsewhere. Western Argus (Kalgoorlie), 6th August 1929. First Found "Colours Of Gold"
At Coolgardie On 17th June, 1893. Step-Daughter Of Mayor H. G. Parsons.